ConceptDraw DIAGRAM is a software for producing flow charts. The software delivers built-in object libraries with vector stencils that allows you to use RapidDraw technology. By clicking on direction arrows one can add a new object to flowchart. Users can start drawing their own flowchart diagrams in fast and simple way. Sample 1. Diagram Flow Chart: Selection sorting method. The algorithm flow chart example "Selection sorting method" was created using the ConceptDraw DIAGRAM diagramming and vector drawing software extended with the Flowcharts solution from the area "Diagrams" of ConceptDraw Solution Park. Flow diagrams is a diagram used for structuring complex system and visually representing a flow and interactions of elements in a system. 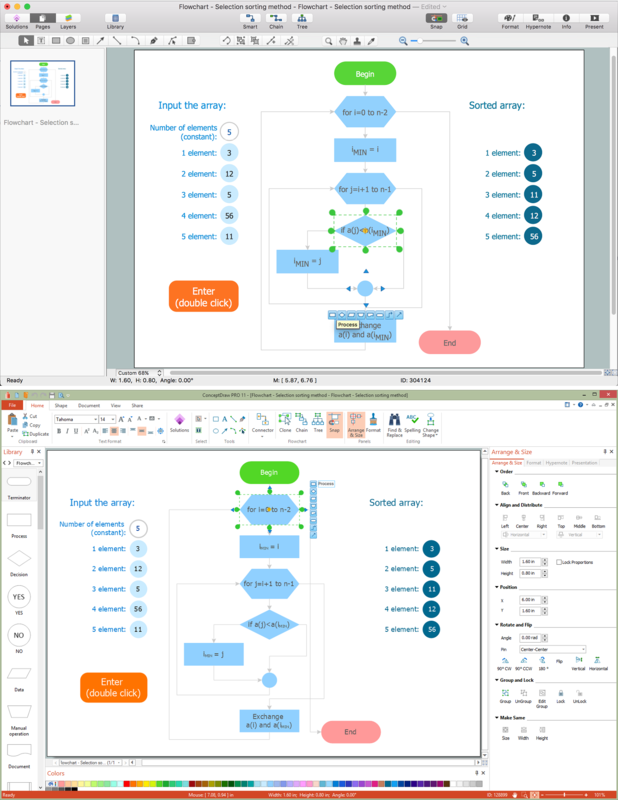 ConceptDraw DIAGRAM v12 diagramming and vector drawing software enhanced with Flowcharts Solution from the "What is a Diagram" Area of ConceptDraw Solution Park is perfect for easy drawing professional looking Flow Diagrams. For drawing Flow Diagrams the Flowcharts Solution provides: 2 libraries with commonly used predesigned vector objects - Flowchart library and Flowcharts Rapid Draw library; collection of Flow Diagrams samples; Basic Flowchart template.